I have made something so fun..and have it linked up to Simon Says Stamp and Show...anything goes!! So step by their blog and see all the fabulous DT work...and entries! Here is the front cover...I think I may have done some earlier posts with this, but it is finished now. at Bella Creations. That FABULOUS brown Flower was made by my sister Bella...Carla. Feel free to stop by and grab this image to play with. Graphics Fairy. The stamping is done using a stamp that I drew, and hand carved. I used some May Art trim..(green leafy trim) throughout this mini, because it is one of my favorite!! I wrote a sweet little message to make it more personal for the one receiving it in the swap. The pink roses are one's I painted in GIMP, and used my Silhouette SD to cut out..so no fussy cutting for me!! All stamping is done in vintage photo with stamps I drew and carved myself. Southern Charm Bella Creations kit. You can find it in the right column on our blog. It is a FABULOUS kit!! A journal tag that I created using my Silhouette SD and a Gecko Galz image. Some more stamping..and as well some doodles with a perfect medium pen..and perfect pearls in perfect copper! My fav!! Here is the photo side. 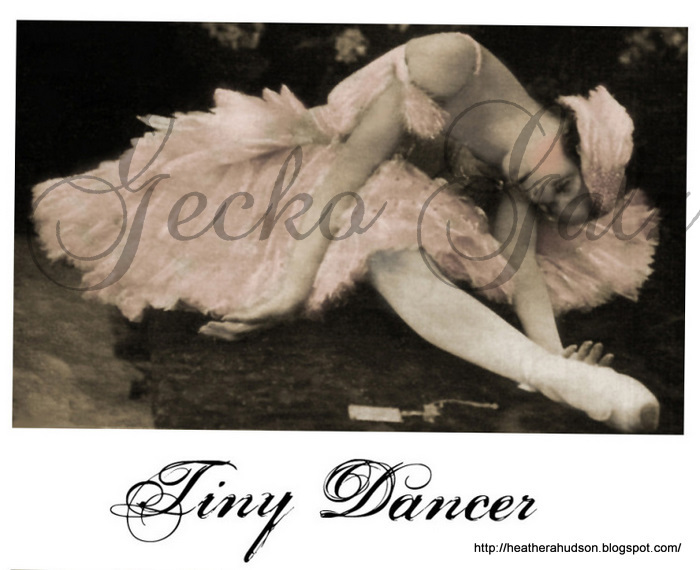 Another Shaped Tag I created using the Gecko Galz image. PP from the Bella kit..and some more of my stamps. I finally used the Dress Form that I drew and created into a stamp using the Teresa Collins stamp maker. It looks awesome on this tag. I used Cardboard to create my cover. I punched two holes with my Crop a Dile big bite and slid in a Timmy bronze D ring to hold the fabby trims. Some of the tags that slide into the top of the mini. The pink rose is one I painted in GIMP. One side is for a photo..the other side for Journaling. I added Flower embellishements to these. I created this tag using the book paper that comes in Alda's flower packages that you purchase...how FUN!! Alda owns the Flying Unircorn. Pansy from Geckogalz...and Rose and leaves on the pansy are from Graphics Fairy. Inside front cover. New image from Gecko Galz...and fabric and polka dot pp from the Southern Charm Bella Kit. Inside back album cover. I love using seed beads as my centers for flowers. How can you NOT love this Maniquin??? Crafter's Companion Sponsor gave us some fabby fairies to play with..just click the link and it will take you to that post to see the front of the cards...here is the insides. I added them to my mini album. The person who gets it..can use them to hold a photo and some journaling...or mail them out to a loved one :-) That large rose is one I painted in GIMP. Gimp Tutorial Page. I promise it is easy peasy..and FREE. These images are all from Graphics Fairy. So glad you stopped by and sorry about the Long post!! Hope you enjoyed my mini album...and it inspires you to create and share!! Hello friends and Visitors..and Welcome to my Blog. Sorry..it has been a short while since I have posted. I have been a busy girl....cleaning....YUCK! Gecko Galz for use in Helene's Challenge at Bella Creations. I used GIMP to paint my dancer..and add pansies to her headpiece and skirt, (If you would like to learn how to use the free program GIMP just click on the link above). I also used GIMP to create a flower frame...to place around my Tiny Dancer. You can find them Here. LeeAnne has a great sale going on...buy 4 Collage sheets, get the 5th free! 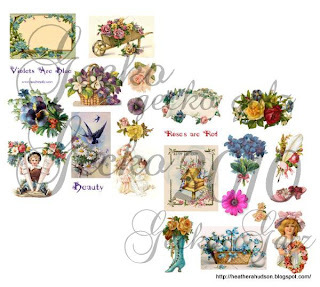 Here Digital collage sheets are sold two sheets per set (for $2.00). So this set would be $2.00. Here are the die cuts I created from the images..on my Silhouette SD below. I created two stick pins...for the Bella Uniqe Stick Pin Challenge. Please check it out...you could win an awesome prize!! The pink flowers on the sides...and little white rosebuds all came from The Flying Unicorn. I am linking this up to The Shabby Tea Room. This week they have a beautiful inspiration photo...and they ask that you use a charm! The DT has some great inspiration pieces...So give them a visit! Gecko Galz and Graphics Fairy. So if you completed the first challenge, please send me a message and I will send you the code for this fabulous Gimp Blinkie!! to get all the directions!! I promise using GIMP can be fun and rewarding! You don't even have to be that computer savvy. First off ....the style is Romantic...and I have done a sketch! 5th Avenue papers. Please check out the link above to see all the beauties you will receive in the kit. All the flowers were from the kit or made with paper from the kit and cut on with my Silhouette SD (except for the two tiny brown roses..those are from my stash). July Oh La La Challenge. Here are some lovely journaling spots..just got to figure out what I want it to say....I created my own mask and inked around them with vintage photo to create some of the flowers images on the paper. I then used perfect pearls to to outline the petals..and freehand some leaves. I used antique buttons for the flower centers. I just loved using the sequins to create flower centers..and the flower shaped sequins to create tiny flowers. I inked all the flowers that came in the kit with vintage photo. Here you can see more of my hand doodled leaf details....and sparkly heart gem. I created this cute little stick pin using the fabric piece that came in the kit...and a pin that I had in my stash. You can see some of my masked flowers. The kit this month is Fabulous!! Flutterbywednesdays! Please check out their site...lots of inspiration there!! Crafter's Companion!! They will be giving away the prize below to one lucky Bella. Talk about fun..the Crafter's Companion sent Lacee the creator of Bella Creations one of these same kits for her to split up and send to the DT to play with. I just LOVE this kit. A girl can create a lot of beautiful things with this kit!! Here are some of the things I have created. I used the fabulous pink fairy and butterfly stamp to place on one of the inside pockets of my mini album. 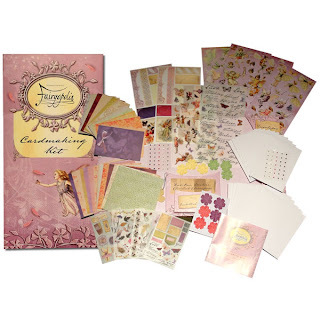 I have some other pages in my album that I used goodies from this kit..I just need to get photos. Here are a few cards and envelopes that I created using my share of this fabulous Card kit. I used the stamps that I received to stamp (black stazon ink) all over one of the envelopes from the kit. I used a paper flower I created..and some lace to dress it up just a tad. Ranger's Distress inks in Fired Brick, Worn Lipstick and Vintage photo were used. I used the same inks on the card itself, and then used one of the rub ons..."Have a wonderful day"..and one of the fabby 3D fairys, butterfly and gems. I made another paper flower and added some trim and leaves. Here is another card. This time I used Ranger's Distress ink in Vintage photo, the butterfly stamp, rub on and fairy image as well as the card base came from the kit. This card uses the cute little fairy rub on, gems, card base, stamps and photo corners that came in the card kit. The LOVE brown stickers came from the Bella Creations July Kit which you can purchase on the Bella Creations Blog. The Tres Chic Challenge this month is simply to create a stick pin. I created two here on my mini cover below..the first one is the cute pink flower pin (from my Bella July Kit) with beads from my stash. I used a Tim Holtz pin to create the second one below. I just added some glass beads from my stash. Hope you check out the Challenge at Bellas..so you have the opportunity to win the fabulous gift from Crafter's Companion. Bella Creations "Southern Charm Kit"
Hello Friends and visitors...I just got home today from a short vacation. I will have to say it was fun, but I am glad to be home. Gecko Galz and I just altered it a little. Here is an up close of my image. The frame is also from Gecko Galz, and I inked it, used some glimmer mist..and Utee to make it all pretty and glitzy. The Paper from the kit is the fabulous Melissa Frances 5th Ave papers! The Fabric that I used as binding, flowers, leaves and pink stick pin...all came in the Southern Charm Kit. The awesome brown flower was made by our own Bella DT gal.. The inside is not quite finished...so I will post photos of it as soon as I have them.